It's been pretty well documented now that pastoralists in low, hot regions have a lower SSR than neighboring agrarian groups. But the only information I can find relates to people older than 24 months. Is there any information on whether or not pastoral children 6 to 24 months are also significantly different? It is a well documented and long-standing finding that body shape varies considerably from location to location (i.e. it is not just between neighbouring pastoralist and agrarian populations but that finding is very important). The reasons for this are many and inter-related. Body shape varies with climate with sitting to standing height ratio (SSR) tending to be lower in populations from areas with higher mean temperatures. The reason for this is believed to be thermoregulatory since SSR is strongly associated with the ratio of body surface area to mass. Altitude also tends to be associated with shorter limbs and large trunks and large chest circumferences. Both of these observations are confirmed by ecological observation and animal experimentation (e.g. random allocation of members of rat litters to experimental arms). Body shape also varies with diet. Secular changes in body shape, exhibited as increases in leg length relative to trunk length, have been reported from different parts of the world. The rapidity of these changes suggests that they are due to environmental factors such as improved nutrition and public health rather than changes in climate. Pastoralist diets (e.g.) tend to contain higher proportions of milk than agrarian diets. Milk contains energy, protein, calcium, micronutrients, and insulin-like growth factor-I (IGF-I) all of which are known to facilitate bone growth. IGF-I is associated with growth in bone length and plasma levels of IGF-I are known to increase in response to milk intake. In Japan, secular changes in body-shape, exhibited as increases in leg length relative to trunk length, occurred after the addition of milk into school feeding programs in the 1950s. It should be noted that long-leggedness may be advantageous to pastoralists. Physical models of walking and running predict that longer legs allow faster natural walking and running speeds (i.e. the walking and running speeds requiring the minimum expenditure of energy) than shorter legs. Faster natural walking and running speeds allow larger ranges with similar energy expenditures. Afar and Somali pastoralists (e.g.) herd on foot without dogs or horses. The ability to walk long distances efficiently may facilitate access to wider grazing ranges and allow (e.g.) larger herds to be maintained. This may lead to the development of a virtuous circle in which longer legs leads to increased grazing range leading to improved livestock condition, larger herds, increased income form livestock and livestock products, and increased milk availability and intake which leads to longer legs and so-on. In such a virtuous circle, "momentum" could be checked by exogenous factors such as drought, livestock disease, and competition for grazing land or endogenous factors limiting limb length. Many pastoralists practice polygyny and the association between wealth and child survival predicted by such a virtuous circle may bestow a considerable reproductive advantage upon long-legged individuals. It should also be noted that short-leggedness may be advantageous to mountain dwellers. Physical models of climbing predict lower energy expenditure and greater load-carrying capacity (due to a mix of lower energy requirements and physically lower centres of gravity of the body and the carried load). In such populations, large trunks bring the advantage of ectothermic homeothermy (Allen's rule and Bergmann's rule) and large chests with large lungs and hearts make the best of reduced oxygen environments (Hesse's Rule). None of the above is at all controversial. It is well-established biology (Allen's Rule, Bergmann's Rule, Hesse's rule). Given this, the WHO (2006) assertion that "children the world over grow similarly when their health and care needs are met" proposed as a justification for the new growth standards is questionable. All of this would not be of much interest to us if we did not use measures of weight-for-height (W/H) as proxies of nutritional status. Using W/H makes us see famines where there are none (low SSR = low W/H or low BMI) and obesity epidemics where there are none (short limbs and big chests = high W/H or high BMI). It makes us deny care to young children with severe wasting while lavishing care on healthier older children. It is sensible to use W/H if we either correct the measurement for body shape (this would require weight, standing height, sitting height, and (probably) chest circumference) or if we use locally derived standards. Given the finding alluded to in the question (i.e. neighbouring groups having very different body shapes) these local standards would probably need to be very local (e.g. we would probably need several local standards in Ethiopia). Local standards are expensive and time-consuming to produce. Since we do not correct W/H and we do not often have appropriate local standards we must accept that the use of W/H in our work is inappropriate. You can see the differences in SSR are there very early on and are persistent. In my own work I have used the 24-59 month group because this simplified measurements in the field (sitting height is a little tricky). * SSR varies over both small and wide areas. * This variation is due to a combination of environmental and genetic factors. * The same variation has been observed in animal models and ecological studies. * The variation is present early in life and is persistent. * Children the world over do not grow similarly when their health and care needs are met. * SRR effects W/H measures rendering simplistic use of W/H universally inappropriate. Thanks for such a quick and thorough reply, Mark. I'll definitely look into those references. In the mean time your answer brings up another question for me. If children as young as 6 months are showing these differences, has he inherited genes from a population that has adapted to a body type most likely to survive in that environment? I'm thinking about the Tutsis in Rwanda and their relatives, the Banyamulenge in DRC. The Banyamulenge are pastoralists who live in a high altitude, rather cold environment, but are about as thin, long-legged and tall as they come. The long-legged would still be good for the very long distances they walk, but not the environment. The local history is that they immigrated from the Nile region hundreds of years ago, which would fit the low-hot pattern. So did they bring those traits with them? Or could it be their continued heavy dependence on cow's milk? The two short lines for Ethiopia are from that paper. I think it is the usual nature / nurture thing of genetics mediated by environment (with diet being included in environment). With humans (and some animal species but to a considerably lesser extent) we have culture as part of the environment. Something as "simple" as wrapping up warm in a cold climate can reduce the effect of the advantage of high central mass / high fat mass particularly if high central mass / high fat mass is associated with negative outcomes (e.g. type II diabetes) that may have a direct or indirect effect on child or grandchild survival. You really need to ask a biologist / physical anthropologist about this. For your specific example ... all we can do is devise a plausible "just so" story (these seem to abound in evolutionary biology). This would go something like ... they brought the trait with them but also bought the cultural trait that equated long-leggedness with fitness so there is a retained sexual selection pressure in favour of long-leggedness. Long-leggedness would have an energy advantage on high plateau but not in mountainous terrain (which do we have?). Then there is the milk. 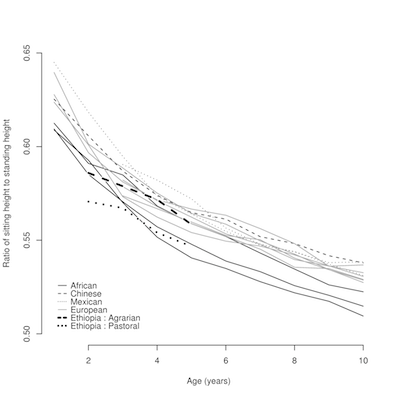 The disadvantage of lacking "gigantothermy" could be overcome by wrapping up warm and other cultural adaptations (e.g. housing, sleeping with livestock, heating, &c.). I'm sure this is unsatisfactory. It is the best I can do.